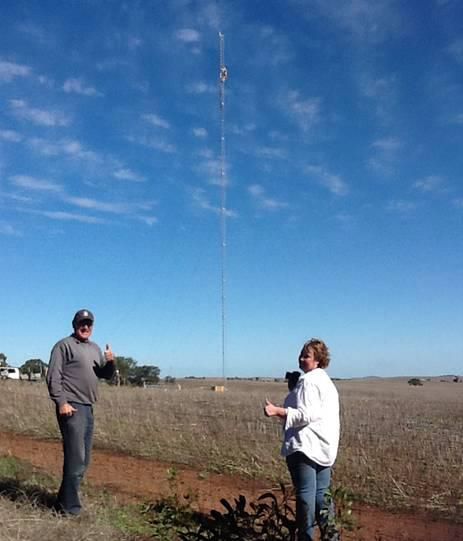 Colin Schaefer (Brady Creek) and Mary Morris (Buchanan) give the thumbs up to Australian Radio Towers workers dismantling an Energy Australia wind monitoring mast near Point Pass in the Mid North of South Australia. This wind monitoring mast for the proposed Robertstown wind farm was taken down today by contractors under direction from Energy Australia. It was erected in 2009, a mere 500 m from a neighbouring farm house and close to the township of Point Pass and dozens of hobby farms and lifestyle blocks. A second tower will be removed tomorrow near Inspiration Point, west of the township of Robertstown. Initially local landowners were supportive when invited to take part in the project in 2005. However, local opposition to the proposed wind farm took off in late 2010, when the nearby Waterloo wind farm started operating and landowners who had signed up for Robertstown wind farm realised they could hear and feel noise and vibration from 8 km away. Nine of the fourteen contracted Robertstown landowners believe they were misled about the impacts of the wind farm – especially noise – and no longer want to be part of the project. Colin Schaefer (pictured) was one of the contracted landowners who changed his mind when Waterloo wind farm started operating. He had worked on the construction at Waterloo and thought it was great idea – until the turbines started turning and his sleep was frequently disturbed. A petition with 345 local signatures against any more turbines being built in the area south of Burra was presented to Energy Australia at a public information session at Marrabel in May 2012. At the site today, Mary Morris thanked Clint Purkiss (Energy Australia) for removing the mast and asked him for his reasons for doing so. He replied “it’s fair to say, we listened”.